This past weekend we went on our biggest cycling adventure in Japan. Probably our most formidable ride ever! 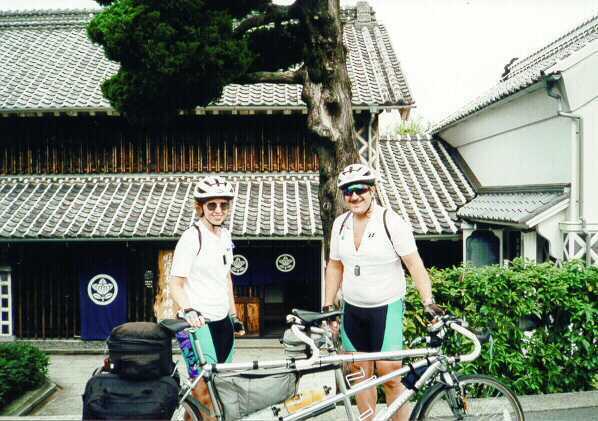 Lindy and I were about to embark on a three-day tandem trip on the Izu Hanto (peninsula). We had spent many evenings contemplating routes, deciding how far we could ride, where to spend the two nights, what to take with us, etc. As the week headed towards Friday we watched the "tenki yoho" (weather forecast) intently. It was showing 20% chance of rain on Saturday, and 30% each on Sunday and Monday. Our experience here indicated that would be "dai jobo desu" (no problem). There were two typhoons just starting to make their appearance on the TV screen, but they were not going to get to the mainland until mid-week. We decided that 40-50 kilometers per day should be well within our abilities, even with 30 pounds of gear and what looked like somewhat hilly terrain, at least based on our topographic maps with 20-meter contours. Our plan was to take the bullet train to Atami-shi at the northeastern end of the peninsula, then take a "limited express" to Shimoda-shi, which was about 2/3 of the way down the eastern Izu coast. We would take three days to bike around the bottom of the peninsula and back up the western side to Mishima-shi, where we would pick up the Shinkansen back to Kakegawa-shi (and our car). We had Lindy's secretary make us reservations at two hotels. 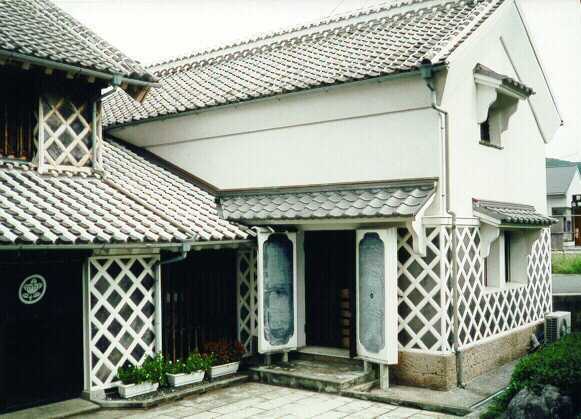 One was a western style hotel; the other Japanese style but it had some western style rooms. We made a bike bag, required to take a bike on the train, out of a plastic tarp and self-stick Velcro. We took the wheels and handlebars off, fastened them to the frame, and closed up the "bag" with the Velcro. Crude, ugly, but functional. Now the question was: would the train personnel mind a really long bike bag? Saturday morning we headed to the station, went through the ticket booth, no problem. They did not even bat an eyelash at the long bag. We stood the tandem up on end between the cars. 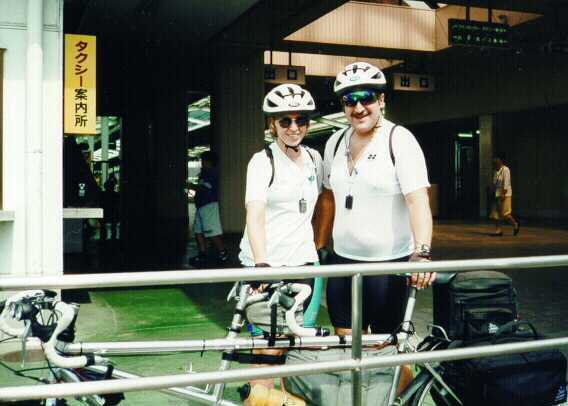 I carried the bike and Lindy carried our gear through the stations. It was not the easiest thing to manage, and Lindy's bags were heavy for her, but we made it to our destination unscathed. We stopped just outside of Shimoda Eki (station) to reassemble the bike. It took just under 30 minutes to get everything back on the bike, including panniers, lights, etc. and the "bag" stowed in one of the panniers. During this time we had an enthusiastic audience of takshi (taxi) drivers and other passersby. We explained to one cabby, in our limited Nihon-go (Japanese) what we were doing, and then he would explain to all of the other people who stopped by. Of course people would ask where we were from, where we were living, how long we had been in Japan, etc. These were common questions that we have answered, and will answer, hundreds of times. We actually hit the road at noon and proceeded to make a big circle around the train station area trying to get out of town! Second try worked. I guess I should have listened to Lindy when she said turn right and I went left. I know Bill, the stoker's always right! About three blocks from the station was a Baskin Robbins Ice Cream Parlor. Only the second one we have seen in Japan, but we passed it by. Very out of character for me! As we left town there was quite a bit of traffic and the road was moderately hilly. At one point we stopped for a view of a beautiful bay beneath us. An older man riding a commuter bike stopped for a chat. He indicated by hand motions that there was climb and climb and climb and........ The main route would not go all the way down to Irozaki (the southernmost point on the Izu) but we had said we would see what the road was like (hill wise) before deciding if we would take the extra distance. Of course, we both really wanted to go to the point, so we went. The road just kept going up and down, too much for tandem rollers, but not high enough to be quad killers. When we got to the lighthouse area we tried to ride up to the cliff area where the lighthouse was located. We stalled out about 2/3 of the way up the paved path. All the people we passed on the way up caught up to us as we stowed the bike against a fence. We figured that it did not pay to push the bike the rest of the way up the hill, so we just left it there. We would never do that in the US! 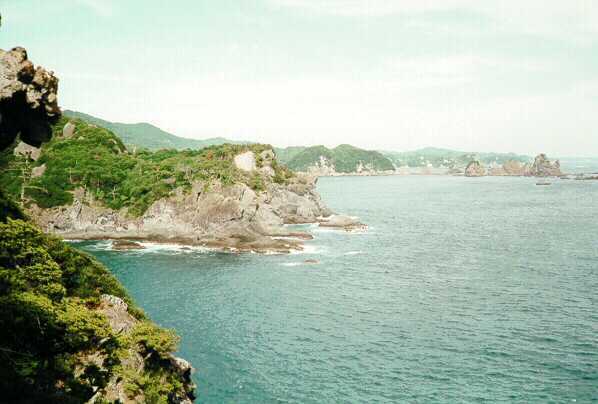 The hike up to the top was not too bad and the point afforded a beautiful view of the rocky shoreline of the Izu Peninsular. There are many small rocky islands that stick up out of the ocean along these points of land. Obviously, they are just extensions of the rocky, jagged peninsula of land on which we were biking. At the top there was a road coming in from the other direction and we joked that it was probably the easy way up. When we returned to the bike we checked distance and altitude before heading back down. Turns out it was a 13-15% grade we tried to go up. Henna gaijin (strange foreigners). At the bottom, we stopped for an ice cream cone. We had one of our usual stilted conversations with the proprietress of the shop. As we were getting ready to leave she brought us out two glasses of iced tea. Very nice. We rode off to the sound of her saying "ki o tsukette kudasai" (be careful please). Well we were off again, and climbing another big hill. At the top we saw a road coming in from the ocean side. We checked our maps again, and realized that if we had pushed the bike up to the top of the trail, another few hundred meters, we could have avoided about 100 meters of vertical. Oh well. We were just beginning to realize how flat this ride along the coast would be. Not! Apparently, volcanic islands, mountains, peninsulas, etc. are just full of steep ups and downs. 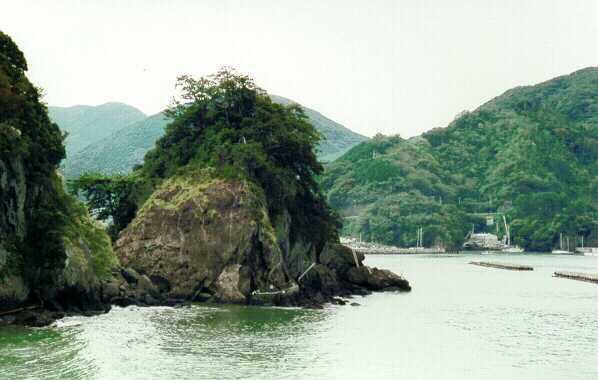 It seems that the peninsula rises very abruptly from the ocean with steep cliffs along most of the coast. This stark topography is broken up by the mountain rivers that flow out to the ocean. These are generally very small rivers, basically creeks, but over time they cut a path down to sea level. At their mouths are the small fishing villages that help to make this a scenic ride. Of course, this means that the road goes along the top edge of the ridge until it comes to one of these many rivers, at which time it dips sharply down to sea level and back up again. It's the ups that are the killers! We would go from top gear to lowest gear in a matter of seconds. I could switch from middle ring to granny and not have to change the rear because in the time it took to shift we would slow down enough to match speed for the lower gear. Then we would quickly run through the rear gears until we were in our 20x32. How low can you go? Now I know that for many teams out there 9-11% grades for a few kilometers at a time are not very difficult, but we are gravitationally challenged. And with 30 pounds of gear, even more so. These hills (OK, mountains) were getting tough. It began to seem like the 40 and 50-meter ups and downs would only be broken up by 150 meters ups and downs. Of course, the downs were on switchbacks so we could not just relax and coast down. Drum brakes are really handy. There was one downhill that did not have sharp turns, but just enough to keep me alert, where we were doing 60 kph (37 mph) with the drum brake on. And it was working! The scenery was really nice. There would be fields of flowers, steep views down to the ocean, lush green stands of bamboo, and of course, small shrines and statues everywhere. My camelback went dry as we went up one of the long steep grades. We were trying to decide how far it was to the next town and if we should transfer some of Lindy's water into mine. As the legs were dying (once again) we stopped at a vegetable stand on the side of the road. A man came out to admire the bike so we asked if we could have some water. He showed me to the outdoor spigot, and we filled up. It tasted good, but we were a little nervous about the fact that it was outside. But obviously, no problem. He, as well as many others, when we told them our route would say something in Japanese that we could not understand. We would be able to pick out a few words from amongst the myriad of unintelligible (to us) babble. These words were invariably "taihen" and "yama", repeated many times. Yama means mountain. Taihen means difficult. We decided, and our legs agreed with this decision, that everybody was telling us it was very hilly. Well, the afternoon was winding down, the road was winding up, and the sun and the temperature was dropping. We made a last rest stop at one of the many scenic overlooks (of which we frequently partook) and got a small snack of wasabi (horseradish) flavored pretzels. Really great! As we headed down the final hills into Matsuzaki-shi we were reward with a panoramic view of the harbor and the city. We wound our way through some local streets until we got to our hotel for the evening, right on the beach. We checked in, left the bike next to the entrance area, and took well-deserved showers. Lindy took an Onsen (hot tub) bath, but I thought the extra 2 showers would be too much work! We found a teppenyaki restaurant for dinner. The food was great. It was steak and vegetables that we barbecued at the table. But we both left hungry. A couple of ice creams on the way home partially took care of that. We watched the end of China Syndrome on TV and went to sleep at 9:30. This day dawned bright and beautiful. We had a buffet breakfast at the hotel. Much more food than we should have eaten prior to a bike ride. But it was good and we had to make up for the small dinner from the night before. We headed out at about 9:00 so we thought we would have a really leisurely ride. This was scheduled to be our shortest day, and we would have all day to do the ride. While looking for dinner the night before, we saw some pretty old buildings (rice storehouses) that we wanted to look at in daylight and take some pictures. We backtracked to them and stopped to take shashin (photos). At that time a group of 5 rickshaws came by. We watched them go and Lindy said we should follow them. We didn't. I know Bill, the stoker is always right. We saw on the news that night that there was a Rickshaw Matsuri (festival) in that town that day. Oh well number two! Then two young women came by and we asked them to take our picture with the tandem in front of the old building. Then they took turns using their video camera to take their pictures with the tandem and us. It turned out that they live in the city that we were heading for that evening. Well, about this easier day we had planned, Not! Up and down, Up and down. There was not a level piece of ground to be found. At least it seemed that way. 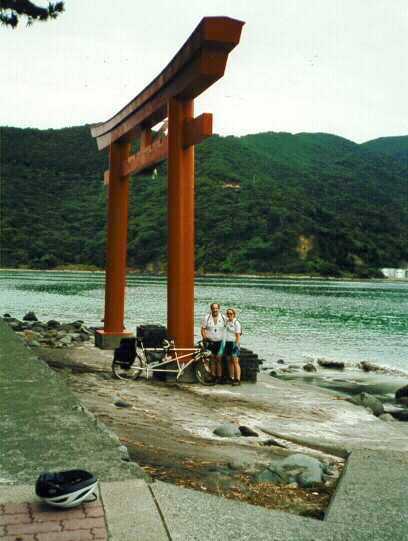 We rode through many tourist towns along the ocean. Sunday traffic was a little heavier than we would have liked, at least for the first 1/2 of the ride. The night before we had pored over the map and made decisions as to when we would stay on the main route, and when we would take the older route. The decisions were based on how much climb the two options appeared to have. We invariably chose what we thought would be the easier option. Any place we stopped we would have people come up to us to ask the questions, and then to tell us about how hilly it was and that it was going to get worse! Such words of encouragement! It was also fun noting how many cars would pass us in either direction on the hills, and have a passenger or driver open the window and give us encouragement saying: "Gambatte" or "Gambarre masho". Basically saying do your best, keep up the good work, keep your chin up, etc. Motorcycles would pass us and give us thumbs up. The locals we met seemed to be genuinely enthusiastic about people riding up these roads. Of course, I think the novelty of the tandem added to it. Today's water refill stop was at a little grocery just south of Toi-cho. We had to ask if the bottle we picked up was water since it could just as well have been Sake. It was Japanese mineral water, though they said they also had Evian if we wanted. In these little 200ml bottles. We said we were cycling and that we wanted a large bottle and they laughed. People were also very curious about the camelbacks, which they all agreed were benri desu (convenient). We had originally thought about staying in Toi-cho, but thought it would make the last day too long. We decided to stay in the next major town, Heda-cho. It was another 15 kilometers up the road. I did say up! The section between Toi and Heda got brutal. Maybe we were just more tired, maybe it got steeper. Either way, we earned every kilometer. Don't get me wrong, this was a beautiful ride, with majestic views of the ocean, and lovely pastoral scenes of mountain villages from high above them on the twisting mountain roads, but it was tough. Many times as we passed people (the ones that were not moving) they would ask, "taihen desu ka? ", is it hard? Lindy would usually say, "Choto taihen desu", a little difficult. I would then say, "totemo taihen desu", very difficult, and they would laugh. Between us we would say, "baka taihen desu", which in the local vernacular is "foolishly difficult". As we made use of one of the many scenic overlook rest stops we had our pictures taken surreptitiously while we approached the stop. The photographer later came over and asked if it was OK to take our pictures, and he proceeded to take the bike and us from all angles. 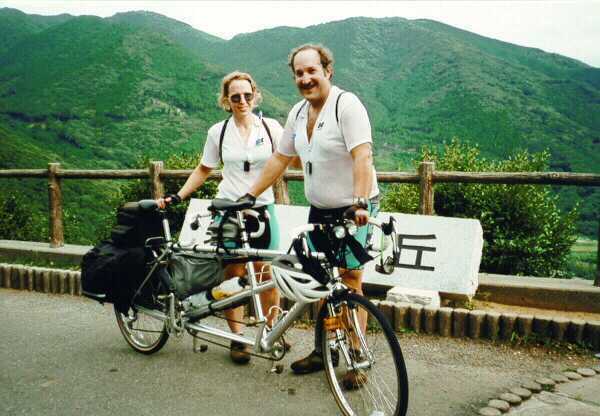 Our conversations in Japanese were much like riding a tandem. As a team we were able to do more than we could as individuals. Either one of us would have great difficulty maintaining any meaningful dialog, but working together, we would complement each other's knowledge (and auditory perception) and be able to communicate. It was kind of nice riding along at "hawk's eye level". The hawks would be circling over the shoreline and hills and be at about our height. They are quite magnificent the way they just glide along and then swoop down. The sides of the road were often bordered by flowering plants such as kanna. These stately plants with their colorful flowers were a great contrast to the ocean below. As we were approaching Heda-cho we started to get glimpses of Fuji-san in the distance. Kind of gray, though it did have a snow cover at the top. We also noticed that where there had been concrete retainer walls built, the plants that grew out of the cracks would sweep the walls clean when the winds blew them around. Must be some strong winds up in these hills. On the final descent toward Heda cho, we passed, and then were passed by a policeman on a motor scooter. He actually had a gun in a holster, something I had not noticed here before. But he ignored the tandem and us. Also on this descent, we passed a monkey playing on the side of the road. We had read that they were in the woods in this area, but we did not expect to see one walking along on the other side. He (or she) paid us no mind. Just before town we took a detour to go out onto the point of the cape that protects the port. It was a quiet little park like area with an old Shinto Shrine, a large Tori gate at the point and a wonderful view of Fuji-san over the bay. We even got a picture of us and the Santana in front of the arched gate. We tried to ride along the beach on a path, but did not get very far due to the sand. The point provided views both out to the ocean with all of the small fishing boats in sight, and back into the port with it's trawlers and small boats. It was really very peaceful with the waves lapping up at the beach while the light became gentle and muted. But it was 3:30 and time to head to the hotel for the evening. We rode the final flat 2 kilometers into town, through the center, and to our hotel. We pulled up in front on the tandem. 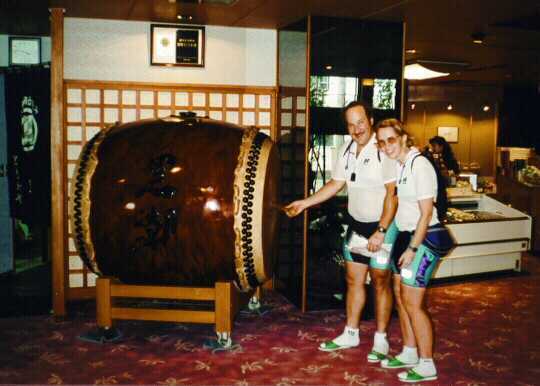 As we dismounted women in kimonos hit a large drum to welcome us. The drum was about 3 1/2 feet in diameter and about 4 feet long. Nice resounding sound. A woman came out to greet us. She spoke about as much English as we spoke Japanese, and that was the best we would do for our stay in this town. We gave her a note that our secretary had given us to facilitate check-in. All Lindy had to do was sign something she could not read! The tandem parking area was in back of the hotel where the workers kept their commuter bikes. Now the bad news. As she checked in, Lindy asked what the weather forecast was for the next day. Ame ga tsuyoku futimasu (heavy rain) typhoon (hurricane). Not good. So much for the long-range forecast of the typhoon not getting to us until at least Wednesday! We took off our shoes in the lobby and were given slippers to wear in the hotel. They do not get many people with size 11 shoes. I did not fit well into what I guess was size 9. Everybody had a good laugh at my feet hanging over the ends of the slippers by about 3 centimeters. We were escorted up to our room, where the kimono clad hostess prepared tea and cakes for us. She was most attentive; though at this point we really wanted her to leave so we could get out of our grungy bike clothes and take showers. She brought me a "3L" yukata (robe) since the ones in the room would obviously be too small for me, and explained the hours of the Onsen to us. We thought we understood, but were not sure. Eventually she left and we took the long awaited shower. 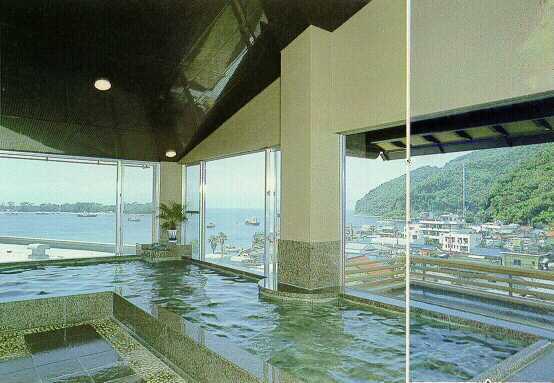 Then to the Onsen. We did not know which was men's and which was women's. We took a guess that since the curtains in front matched our yukatas that we should go into the corresponding doorways. We were right, though we do not know if it was coincidence or not!. To use a Japanese hot bath, you first have to wash up using a hand towel and small bucket. No matter that we had just taken real showers. Then rinse all of the soap off using the small hand towel. Then you can enter the water. There were two soaking areas, one inside, one outside. Since the outside one was crowded I chose to use the inside one which was empty. It was soothing and had picture windows overlooking the town. After a while the outer bath was vacant, so I ventured out. That water was hot! I could not stay submerged in it for very long. 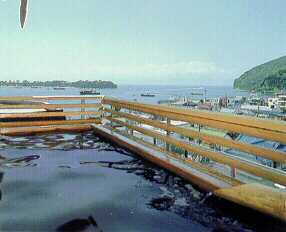 It did seem strange to be sitting out on this verandah on the fifth floor, buck naked, looking over the town. After I was fully cooked I went back in and rinsed off. True aficionados would not rinse off the minerals, but I did. We watched the news to catch the weather report and saw that there was not a typhoon coming, there were two typhoons heading our way! One from the south and one from the east. Not good. Probability of rain: 90%-100%. We decided it was time for some contingency plans. We could take a ferry in the morning up to Numazu and then either take a train to Mishima or bike the 10 kilometers to the Shinkansen. Or we could head inland, up the Shuzenji Pass, and pick up a train there. The idea of climbing a mountain pass did not appeal to us. Also, typhoon notwithstanding, we decided that we did not want to (maybe could not) do another day with all of the climb we had been doing. Careful scrutiny of the maps showed that there would be more rough climb for about 8-10 kilometers, but then we would be going along at about sea level for the rest of the ride. It looked like we would not have to go above 30 meters above sea level for the last 35 kilometers of the ride. Still would have climbs, but not the long steep killers. We decided that if it were raining lightly in the morning we would try to ride. If it was heavy rain we would take the ferry. We did not decide what to do if it was between the two! Dinner. 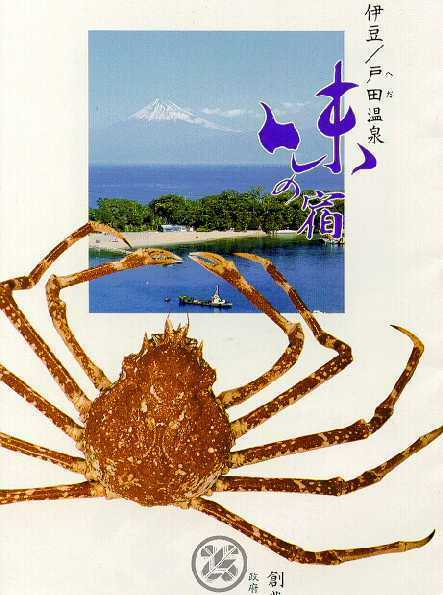 We asked for a restaurant for kani (crab) since this area is noted for crab, but the people at the desk said nai (not). I don't know if they are out of season, or if the restaurants are closed on Sundays. They recommended a noodle restaurant so off we went. On the way to the restaurant we stopped at a grocery and picked up some raisin bread and raisin rolls for breakfast the next day. We ended up at a noodle shop where we had an adventure in ordering. The menu was on the wall (in Japanese of course) and we had to write down what we wanted (in Japanese of course). One of the other patrons provided some help by reading off what some of the items were. Lindy did an admirable job of copying the kanji (Japanese characters) off the wall since we got what we asked for: 2 orders of noodles with soy sauce, 2 orders of gioza (dumplings) and Chinese pilaf (fried rice). Lindy also got a bottle of Sake, which she shared with the person who helped us to order. While we were waiting for our food another woman came over and gave us some yakatori (chicken on a stick and grilled) and asked us all of the usual questions. She then explained us to everybody else. The food was excellent, and the quantity sufficient. I had plans to get a small ice cream on the way back to the hotel, but the shops were closed by the time we finished dinner. When we got back to our room, we found a fruit platter waiting for us. It was wonderful and really hit the spot. One more look at the weather report. No change. Not good. We decided to try and get an early start, on the road by 8:00, thinking that the weather would only be getting worse as the day wore on. We shuddered at the thought of riding in a Typhoon, and went to sleep. Up at 6:00. Looked out the window. Slightly wet ground, very gray skies, but not raining. Ate 2 slices of bread, got dressed, and got out. There was some difficulty checking out since they could not understand why we were leaving so early. But finally we paid our bill and loaded up the tandem. We were wished a safe journey and told to be careful by the three people who came out to see us off. This was the usual level of attention paid to their guests, but I am sure we are amongst the strangest guests that they have had. 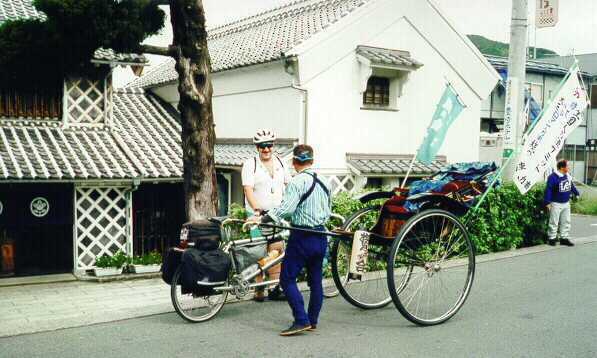 Gaijin on a tandem bicycle! We actually started pedaling at 7:00. I am not a morning person, but I was motivated that morning! One half kilometer from the hotel we got to the edge of town, dropped into granny and started climbing. The climb was all we had expected, and more. It just kept going, and going, and ... It was the energizer bunny of climbs, but I was the brand X of climbers. We stopped twice on the way up this little hill. We would play the game of me asking the elevation every 1/10-kilometer so we could track the grade. It varied from 8% at overlooks to 11 1/2% on sharp switchbacks. There was not much traffic on this road since it was early, and not a bus route. As usual, we were told "Gambatte" by some of the few cars that passed us. At each switchback that took us close to the ocean the wind was fierce. We would have a headwind on the 10-11% grades. It was actually nice since it cooled us down, and at that speed did not slow us that much. But at the turns the crosswind made things a little difficult. Also, we were both worried (though neither of us mentioned it) that when we reached sea level and had to head east, there would be a bad headwind. After what seemed like an interminable climb, we got to a crest, rode a fairly level section for a little while and then started the dive to the ocean. Fortunately, they have built another tunnel so we only went down about 50 meters before we started climbing again. We bypassed a few tunnels by taking the old narrow road that went around the edge of the hill. These were nice since they had no traffic and provided better scenery. One of them was actually closed since part of the roadway had collapsed, but it was passable for a tandem. This section was so quiet that the flock of birds we startled did not seem to understand why someone was up there on their road. These birds looked like goldfinches and would scatter and then land again 10 meters ahead of us. This scene repeated itself 3 or 4 times before we finally passed them. Another 150 meters up at 9-10%. Then the real top of the day's ride. We were pushing ourselves because of the impending weather, and because we knew that this would be the end of the serious climbs. 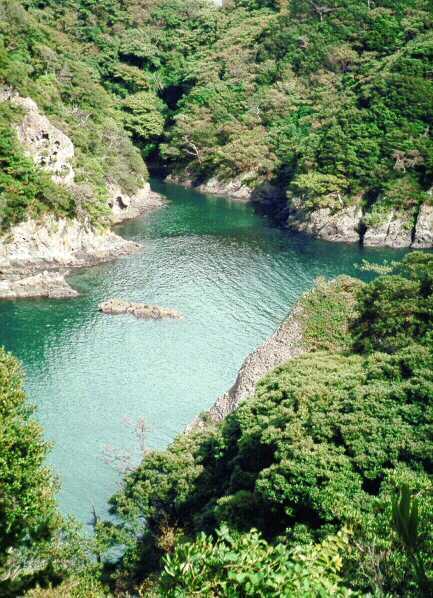 Finally, the descent to Osezaki. We had wanted to stop and go out to the point of this cape, but under the circumstances we felt it was the better part of valor to continue. From the descent on we were afforded numerous views of Fuji over the water, over the hills, etc. We were now heading east toward the neck of the peninsula. We got lucky, no significant headwinds. Even the map was correct, no great hills to climb. We did break out in a chorus of "Long and Winding Road" since we seemed to follow every nook and cranny along this coastline. It was really picturesque. We would go from one little fishing village to another. We could see the next one coming as we rounded the points going out into the bay. Also, every time we rounded the points we would have another view of Fuji-san in front of us. It seemed like every town had it's own Fuji! We stopped outside an elementary school for some raisin rolls and a bathroom break. It was just at the time of morning that the mothers were dropping the kids off for the day. For the first time this weekend, we were invisible. I don't know why, but we were completely ignored except for one mother who said "ohaiyogazaimasu" (good morning). Then we were off again continuing our quest to beat the typhoon to the train station. After a while I started thinking about lunch. Then I looked at my watch and saw that it was only 9:07. A little early for lunch, but tell that to my stomach! We passed by the SS Scandinavia, a retired luxury liner that has been converted into a luxury hotel. We also went past some islands just outside of Izu Nagaoka which are connected to the mainland via a ropeway (cable car). If the weather weren't threatening it would have been a nice side trip. But onward we must go. Quick stop at a 7-11 for an ice cream. So what if it is only 9:15. Ice cream is one of the four major food groups. Quick pit stop for Lindy and we are off again. We are cruising, compared to the rest of the trip. We were now heading north toward Mishima-shi and the train. Drip. Drip. Drip. Just a drizzle, not bad. Keep on going. It never got worse, just a little light drizzle. The last 5 kilometers to the station were right up a four-lane boulevard. At one point there was a nice bike path on the opposite side of the road, so we went over to it. At the intersections there would be sharp down and up ramps to get to road level and back up to the path (which was actually just a nice sidewalk). As we barreled along to one intersection I yelled, "big bump" as I saw that there was no down ramp. As we bounced down to the street I noticed that there was no up ramp. Can we bunny hop up a 5-inch curb? No! Hard brake, quick turn, quick stop. I guess we'll stay in the road. We had planned on taking smaller side roads to avoid the traffic, but they would have lengthened the trip and at this point we wanted the shortest time to the station. Heavy traffic, but no problem. Cars, trucks, buses, they all went around us when necessary. Occasionally we would get up on the sidewalk, but usually it was so inconsistent in width and surface that we did not stay on it very long. The dripping stopped. We are dry once again. We see the train tracks in the distance. One more left turn to go along the tracks to the station. We stopped in front of the station, just off to the side to be out of the way but still under cover. The usual crew of cabbies gathered to watch us disassemble the bike and load it into the bag. As usual, we were asked many questions and gave the answers to the first person that was bold enough to come talk to us. He then told everybody else what we did, where we had been, where we were going, etc. It took 25 minutes from the time we stopped to the time we were packed up and buying our tickets. 42 minutes after we stopped at the station we were on the train heading home. Again, nobody batted an eyelash at our long, homemade bike bag. Oh, by the way, within 10 minutes of getting on the train it was pouring!! Summary: Great ride, more difficult than we had planned. Beautiful scenery, friendly people. Would we do it again? Probably not. It was worth it, but there are still many other places to explore. We are currently planning a ride for the end of this month into the Japanese Alps. I guess we never learn! At least for most of that ride the tandem will be street legal. Nagano is one of two prefectures that allow tandems on the roads. Also, special thanks to our friends Bruce and Ethan who got us a new front derailleur in time for this glorious journey.